Rite of Christian Initiation of Adults is for any adult who is not baptized, any adult who was baptized in another Christian faith tradition, or any baptized Catholic who has not received their First Communion and/or First Penance. RCIA prepares these adults for full communion with the Catholic Church. From the experience of the early Church, the way someone learned about the Catholic faith was thru a series of ongoing opportunities for education as well as formation with other inquirers. 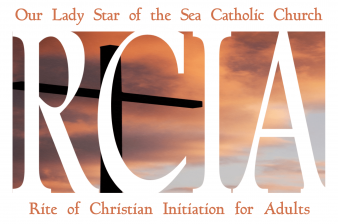 Here at Our Lady Star of the Sea Parish, the Rite of Christian Initiation of Adults began September 2018. If you or someone you know is interested in becoming Catholic, please call the parish office (904) 285 2698.